Ah, sorry ... last page was a killer ... well not really ... kinda ... ah hope you guys enjoy the last page XD. I DO NOT TRANSLATE STUFF FROM JAPANESE TO ENGLISH. I do however refer to the RAW [Japanese] version sometimes when translating to kind of double check and make it more 'Real' cos i like it lol. I do not scan doujinshis, so i don't claim credit for it, i got the scans from Yamibo, so please do not ask me where I purchase or scan the doujinshi cos I don't. I do not draw doujinshis, i'm not that artistic =). So i don't claim credit for doujinshi images/pages in this post. I would had clearly stated the author of the doujinshi so go search for him/her/them. The reason why I had added my blog URL in the pages is cos ... well, I translated the darn thing from Mandarin to English afterall! Lastly, thank the translator of Yamibo for translating to Mandarin, if not, I wouldn't be able to translate it to English =). Click on the pictures and out pops a window with a bigger, clearer dimension. Please do not hotlink on forums, just paste my blog url and direct them to the Manga Page section, thanks. 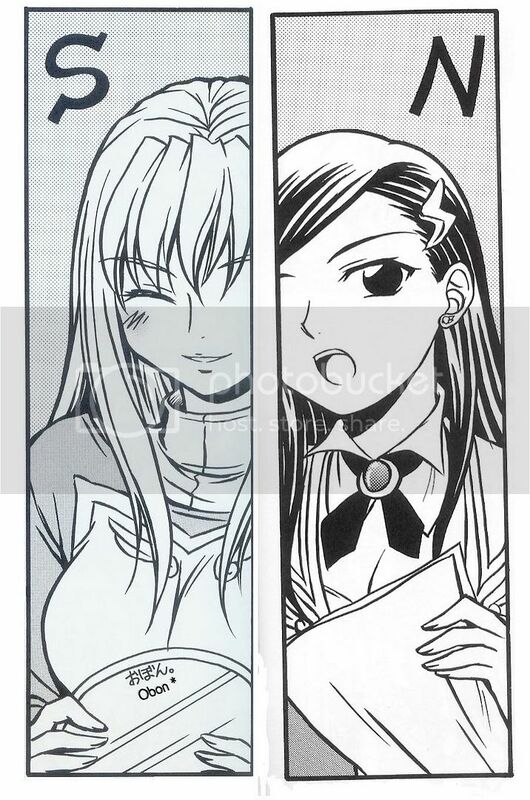 The title of the book Shizuru's holding in Japanese is '美少女グルメ, 失神5秒前' [Bishoujo Gurume, Shitsushin Byoumae] and in English, 'Beautiful Girls Gourmet, 5 Seconds Before Losing Their Senses'. On the side, like BL = Boys Love while GL = Girls Love. '同人誌' [Doujinshi] = Fanbook, meaning published by fans. Pretty suggestive title I say lol, even more with the '4 Girls & Fujino Shizuru In ...' XD. As for 'This' and 'That', well you know ... this and that lol. 'おぼん' [Obon] = Bon Festival or Lantern Festival. Finally, thank you all for your patience, took me almost 3 weeks -.-||| but I enjoyed it. Sometimes I find meaning in life when I do translations ... haha. Ok while waiting for MegaUpload to upload the zipped format of Doropanda Tours Mai Otome Volume 2 Doujinshi, let me ramble something about my daily life. Life's been so ... lost for me, after graduation it got even worse but at least I have something to focus now ... that is to get my driver's license within probably 6 months. After that ... I dunno what to do anymore, work? Study? Slack? Dad don't want me to work in his company for too long ... he wants me to go out and get 'bullied' first lol. From young, I don't really have any ambitions ... when people ask me what I wanna be when I grow up, I replied, 'I don't know.' Why? I dunno why. I seriously dunno. Why am I so useless, why don't I have any ambitions for me to look forward or work towards? Once, I seriously considered being a Zoo Keeper haha, but mummy scolded me. Then I don't have any dreams anymore ... life is just blank for me, speaking of which I seldom dream too lol, ahhhh. Alrighty, enough of sad things, I didn't intend to type sad stuff haha, my life's just so boring. Hm, ok I booked my Theory Practice and Evaluation tomorrow, hope I do well in them then I can go take the Theory Test, after that I'll go for the Final Theory Practice, Evaluation and finally Test then I can go for some Practical lessons yay~ Must get to car ... yawn I'm getting freaking tired ... gotta wake up at 6 AM ... sigh cya.